How do companies hedge currency risks? Hardly anyone knows this better than the department heads, who actively support corporate clients with currency hedging. They give insights into their work in short interviews. Swiss companies have strong connections internationally. Even SMEs are heavily export-oriented, a fact that was demonstrated by a Credit Suisse study on exchange rates and currency hedging. And as a small country, Switzerland is particularly reliant on sales markets outside of its own internal market. Accordingly, companies in Switzerland are exposed to currency risks. However, the way they handle the risks and what challenges exchange rate fluctuations pose differ depending on the specific situation. The Credit Suisse department areas face various concerns. In brief interviews, Andreas Gerber, Head of SME Switzerland; Herbert Plank, Head of Trade Finance; and Albert Angehrn, Head of Large Swiss Corporates Switzerland talk about what concerns their clients and – in a second part – what Credit Suisse offers in the respective areas. Andreas Gerber joined Credit Suisse in 1989 and has headed the SME business in Switzerland since April 2015. In addition, he has been the President of the Swiss Venture Club (SVC), Switzerland’s leading entrepreneurial network, since 2017. What approaches do SMEs generally pursue when hedging currency risks? 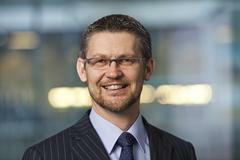 Andreas Gerber: It depends above all on the currency composition of the balance sheet and income statement. An SME whose incoming and outgoing payments are in the same currency will have different needs than a firm with a more complicated set-up. 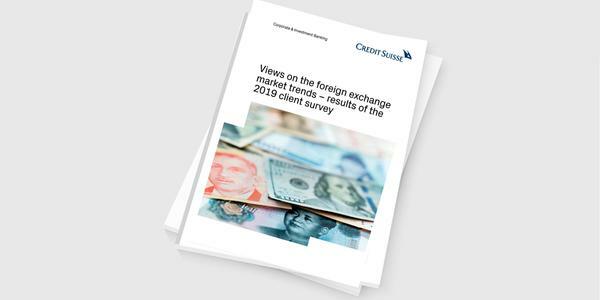 Foreign currency strategies consequently vary, and we see everything from spot-only transactions to highly individual forward, option, or swap transactions. A clear distinction needs to be drawn between currency hedging and currency speculation. Here SMEs are clearly doing the former: using intelligent FX hedging to protect the success of their core business. Herbert Plank (born in 1966) began working with Credit Suisse in 1984 and has led Trade Finance with teams in Zurich, Geneva, Lugano, and Wroclaw since September 2015. In addition, he was named Head of Corporate Solutions in 2016. What role does currency hedging play for commodity traders? Herbert Plank: Currencies are very important in the area of trade finance. The vast majority of commodity transactions still take place in USD. However, we shouldn't forget that goods – or the products made from them – are sold in local currencies. This means that currency hedging can play a major role, particularly for the distribution business – not necessarily for each individual commodity transaction, but for the underlying business model. 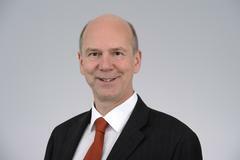 Albert Angehrn joined Credit Suisse in October 1984 as a commercial banking trainee. In 2003, he took over leadership of the Large Swiss Corporates business in Switzerland. Strategic transactions such as acquisitions and mergers are an attractive option for large companies, particularly at a time when interest rates are low. How does Credit Suisse support its clients in this area with regard to currency risk? Albert Angehrn: From a financing perspective, periods of extremely low interest rates and a very strong home currency present ideal opportunities for takeovers. The purchase of the foreign currency and hedging of an exchange rate into the future are a standard part of our product range. But we can also offer our clients deal contingent hedges, where we accept the currency risk if a transaction fails to materialize due to a regulatory decision. Examples have shown that these risks can very quickly run into the tens of millions – even when markets are not very volatile. What sets Credit Suisse apart from the competition when it comes to hedging currency risk? 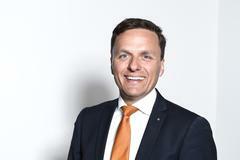 Albert Angehrn: I regard client focus and service quality as competitive advantages. In addition to the standard products, we also have unique products such as the deal contingent hedge. Therefore, on top of going the extra mile, we also have the extra product. That's the way we can build a clear competitive advantage. Andreas Gerber: The Swiss economy is characterized by a dynamic SME sector, and as a strong and strategic banking partner we help support this dynamism, as well as the companies' competitiveness and innovation, across all areas. As well as having a local presence, we have access to a global organization – enabling us to stand out clearly. Our role as the "Bank for Entrepreneurs" also means being able to give clients the best possible holistic advice. We are able to address both the client's business needs and private needs. Furthermore, a strong network of partners including the SVC enables us to offer clear value added to our clients. We are strongly positioned as a "Bank for Entrepreneurs" and also meet the multi-faceted requirements of management. Herbert Plank: Credit Suisse has supported commodity trading houses for more than 30 years, and is therefore highly familiar with client requirements. The bank provides its clients with a range of products, including corporate banking products such as forex, loans, and letters of credit, as well as investment banking products. In this way, we are strongly positioned as a "Bank for Entrepreneurs" and also meet the multi-faceted requirements of management. We support our clients in many areas, and are constantly striving to raise the quality of our services. Swiss companies are exposed to currency risks. The majority hedge.